Dr. Ph. Martin's Bombay India Inks offer powerful color in a convenient dropper-stopper glass bottle. These highly pigmented India inks not only remain lightfast and permanent, but are also totally waterproof when dry. They adhere to nearly all surfaces and are non-clogging when used in pens. 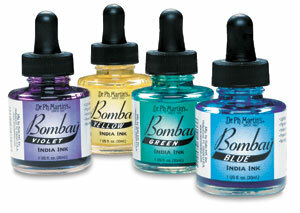 Bombay Pen Cleaner — Remove dried india inks and shellac based inks from technical pens, lettering pens, and brushes. Bombay Pen Cleaner works in just minutes. Round Set 2 — Includes twelve 1 oz dropper bottles of ink in Golden Yellow, Orange, Tangerine, Crimson, Cherry Red, Red Violet, Aqua, Turquoise, Yellow Ochre, Terra Cotta, Van Dyke Brown, and Sepia. Round Set 1 — Includes twelve 1 oz dropper bottles of ink in Red, Magenta, Bright Red, Yellow, White, Black, Violet, Blue, Grass Green, Brown, Teal, and Green.